Our core purpose is to serve Britain’s shoppers a little better every day and being a LGV driver you do this by providing our customers with the products they need to have their best shopping experience. We believe in doing the little things that really matter to our customers and colleagues. It's part of what makes Tesco such a great place to work and why we invest in to your development needs. Whether you are looking for stability or flexibility to suit your lifestyle, or the opportunity to progress your career, this can be the role for you. For most of the day you’ll feel like your own boss, delivering to your stores on your own, but with a team of managers and colleagues back at base ready to support you when you need them. - Able to adapt to working in a fast paced ever changing environment? All you need is to have a full C + E licence, a valid driving qualification card and have less than 6 points on your licence. 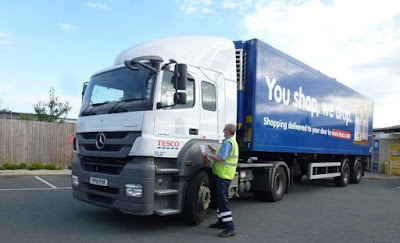 As a LGV driver at Tesco we offer excellent benefits and rewards. • Colleague Discount Card (including a 2nd card for a family member) after 6 months service with 10% off most purchases at Tesco. • The Tesco Retirement Savings Plan – save between 4% and 7.5%, and Tesco will match your contribution. • Share Schemes – Join ‘Buy As You Earn’ after 3 months, and ‘Save As You Earn’ after 1 year.